Labour Day weekend is always a sign that summer is coming to an end and that colder weather is just around the corner. This final long weekend of the summer is a perfect opportunity to prepare your hot tub for the winter. You will enjoy using your hot tub in the winter by being prepared you will save heating costs, and enjoy your hot tub even more. 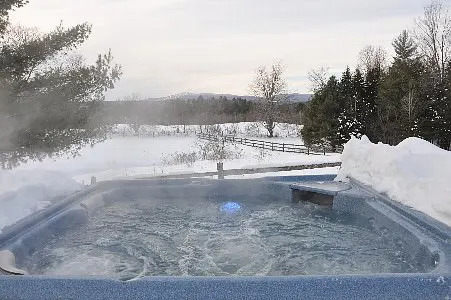 The first part of this article is for people who intend to use their hot tub in the winter months, while the second part is for those who don’t. 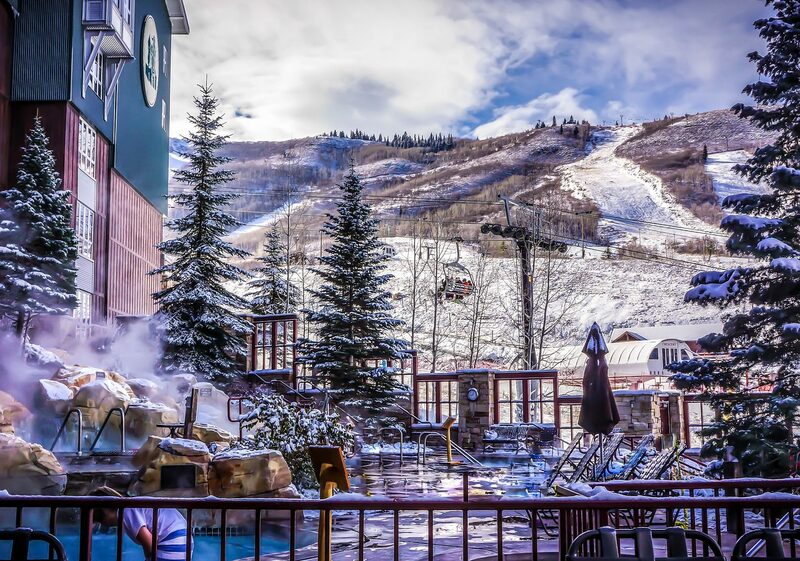 We put together this Hut Tub Winter Guide for you to enjoy what many people call the best hot tubbing season. 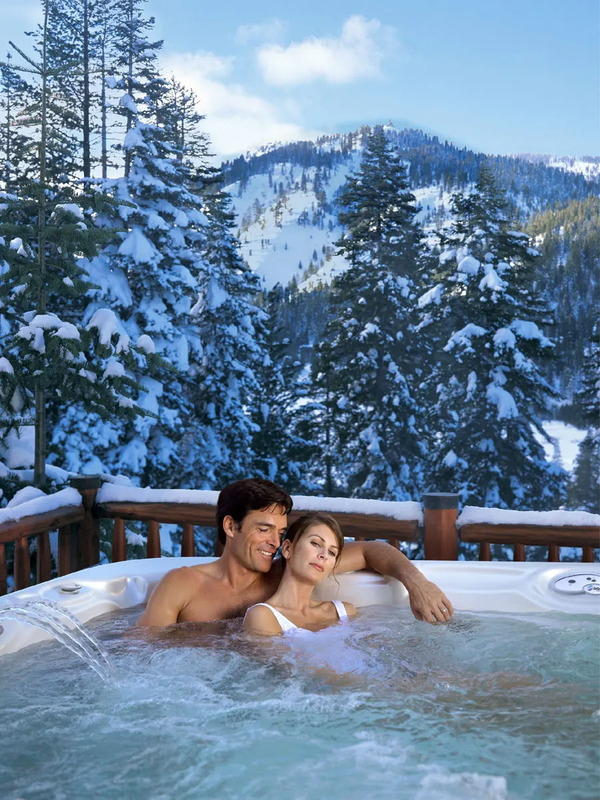 Great, you chose to use your hot tub during the winter months and enjoy the majestic snowy evenings. All it takes is just a few winter hot tub care preparation. Before doing any of these following steps, we recommend you to have your owner’s manual nearby. Should they happen, you’ll be ready to read the errors messages and warnings. First, as soon as the temperature drops down, turn your hot tub into « no-freeze » mode. It is possible that the setting on your hot tub isn’t called the same way, but every spas should have one. Turning this mode on will keep your hot tub warm all day long, and prevent any parts from being damaged due to the freezing. Then, this may seems like a no-brainer, but keep the cover on at all times when you’re not using it. Even if it’s freezing cold outside. Should there be a power loss, having the cover on will maintain the water temperature, even for a few days. Tip : If the power out persists, a good trick is to setup a working light in the power pack compartment of your hot tub. The heat generated will keep your power pack from freezing. Keeping your hot tub warm is a major factor in helping to protect it through the winter months. Also, remember that water that is too hot can be harmful. The recommended temperature is 102°F. The reason is that the human body does not adapt well to extreme and quickly changes of temperature. Keep in mind that hot tub session should not last more than 30 minutes at a time in order to prevent temporary shock or dizziness, or faints. Finally, remember to maintain your hot tub chemicals even during the winter time. Click here to know more about water chemistry. We recommend you inspect and clean your hot tub in the fall, for the simple reason that few people like to work outside in the cold winter days. Are there any leaks? Look at the perimeters of your spa for water stains that might indicate leaks. If you find any problematic areas, remove the cabinet and inspect the foam insulation around the area where you found water. The more saturated the foam the closer you are to the leak. Pull away the foam until you have located the leak. Fix the leak so you are water tight for the winter. Are your pumps, water pack and all other equipment running perfectly? Make sure to tighten all connections and clamps. Give your plumbing system a good flush as well in order to remove any build up that may have accumulated during the past months. See your Owner’s manual for instructions on how to do the flush. We recommend you to clean the filter. A dirty filter will shut down your hot tub because the water flow isn’t sufficient enough to operate the heater. If your cover is damaged, now would be the perfect time to change it. The most common hot tub cover damage is water saturation. You can tell when your cover is saturated with water when the spa cover becomes too heavy to take off your hot tub. And a water saturated cover will turn into a giant block of ice during winter. A quality hot tub cover will provide a good protection and will keep your heating costs down. Choose a hot tub cover that is right for your climate. Make sure you choose a hot tub cover that fits your hot tub well and is custom fitted to give you the best savings and service. A hot tub cover that fits well will also help to keep out the snow, rain and debris. The money you spend on a good hot tub cover will come back in your wallet in no time with the amount you’ll be saving on your electricity bill. Furthermore, a cover lifter will make the process of removing your hot tub cover faster so you’re not standing in the cold too long. You can also use a Bubble Cover to add even more protection against heat loss. Monitoring your hot tub water level is very important in the winter months. If the water level is too low, the pumps can malfunction and cause the freezing of the water. Which would damage the hot tub mold and the plumbing fixtures and parts. Tip : Keep a hose in your house during the winter months, so it’s easier to fill up your hot tub when needed. You will need to thaw the outside water spigot with hot water to unfreeze the tap, and then hook up your hose and fill up the hot tub. Also, remember to often check the temperature of the water in the hot tub so you know that the heater on the tub is working properly. Keep a good snow shovel close to the door that lead to your hot tub, so you can remove the snow around your hot tub and make a clear path to the spa. Also get a soft bristle broom to remove the snow and ice from the top of your cover. A hard shovel or scraper would cause damage to the vinyl of your cover. Remember to do it frequently, even when you’re not using your spa to prevent the accumulation to cause damages to your cover. A great insulated hard top cover is essential, and a hot tub cover cap will provide even more protection to not only the hot tub, but also to the hot tub cover. The hot tub cover cap will help keep foreign objects, snow, and ice off your cover and hot tub. The hot tub cover cap is a poly woven cover that goes over your hot tub cover. The cover cap gives that extra level of protection. If you don’t intend to use your hot tub in the winter months, it’s important that you perform proper winterization techniques. Not doing so can cause your hot tub to freeze, which can lead to extensive damage. In particular, the water pump and lines will likely need to be replaced. To prevent this from happening, there are a few steps you will need to take. Turn off the circuit breaker to prevent electrical shock and drain the spa. Do not close the drain spout when finished. Make sure to dry out the remaining water left at the bottom. Check your Owner’s Manual for more instructions on how to drain your hot tub. If equipped with an air channel and blower system, turn off the heater and activate the blower in order to purge water from the lines. The jets have to be fully open during this step. Unscrew or loosen all hot tub’s fittings and allow water to get out. Water get into these areas as well when the hot tub is in use. Put the fittings back. Remove all drain plugs, especially those attached to the pump housing, filter canister and heater. These parts need to be completely dry before you put your spa to a rest. Get rid of the water that is present in the jet piping by blowing it out with an air compressor. Install a hot tub cover after everything is complete. The cover will prevent debris from getting inside the hot tub when in storage. Even if you won’t be using it for months, now would be a good time to check if any parts need to be replaced. Your Owner’s Manual will guide you on how and when the parts of your hot tub need to be replaced. 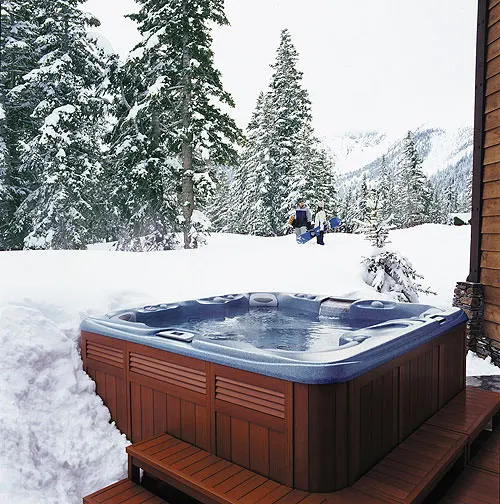 Whether you intend to use your hot tub in the winter months or not, you’ll have to prepare it for the cold weather if you want to be able to use it at its full potential next season. If you do intend to use your spa in the winter, remember to inspect and clean it before the cold days, change your hot tub cover if you need a new one, frequently monitor your water level and chemistry and keep it clear from ice and snow at all time. We also recommend you to follow the basic safety rules and care stated in the first part of the article. If you choose to not use your hot tub in the winter, you’ll have to drain it, clean it and store it properly.